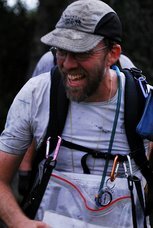 This is my site on my experiences with adventure racing. 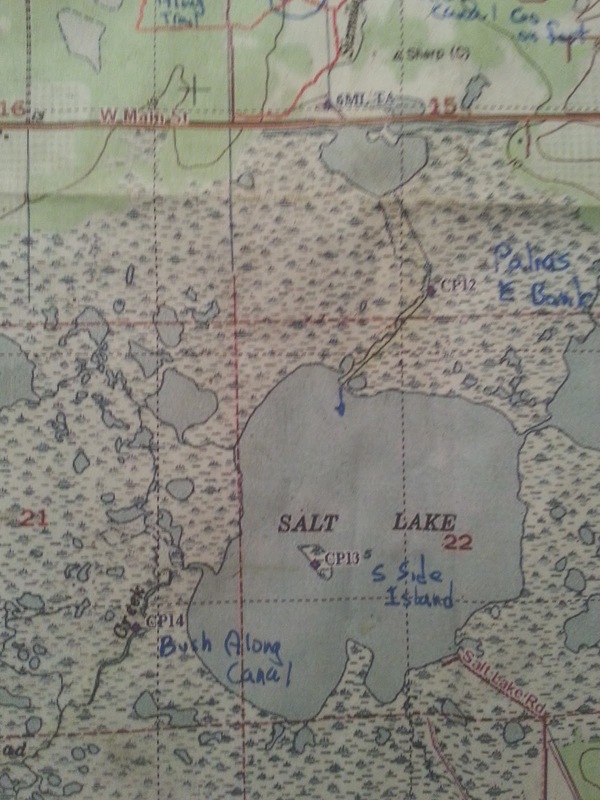 You may see many of these articles published elsewhere as I write for a number of navigation, outdoor, and adventure magazines (normally in condensed and edited versions). This blog contains the full unedited versions of these stories. 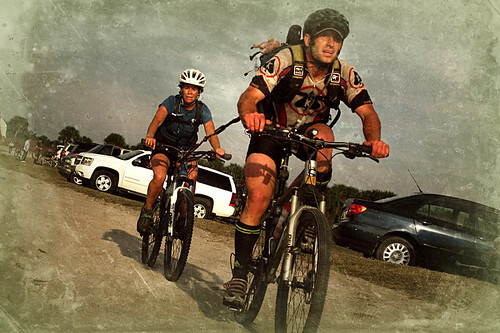 The Turkey Burn is pretty much the annual state championship for adventure racing. 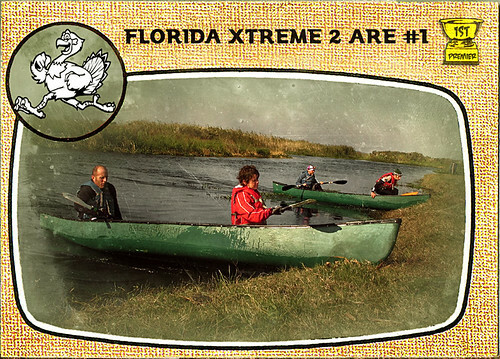 This is the race that team Florida Xtreme 2 had been psyching for during the last few races of the season. We knew there would be some serious competition. Good 'Nuff, a team with excellent athletics, Primal Instinct with solid navigation and relentless forward movement. This race also has a 4 AM start meaning we would have about 3 hours of the race in the dark and 9 hours of the race in the light. This means navigating under both conditions. The other factor is cold. The start of the race is usually quite cold and quite warm towards the end of the race. Here is a blow by blow of the race as experienced by team FLX2 (Jim Gorton, Wanda Timmons, Erik Wise, Ron Eaglin). 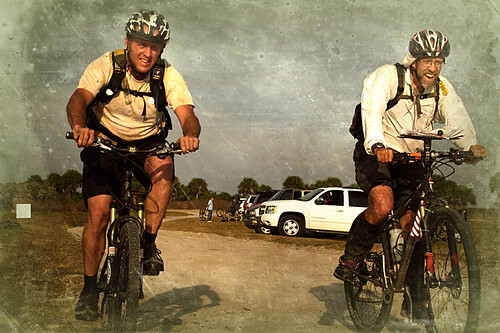 The race would start with a bike leg through the trails of Seminole Ranch. There was only on CP in the first part of this section. Most of the bike team took off very quickly, we stayed near the back of the pack - allowing us to warm up as we continued to ride. The section had some treacherous holes and Jim took a couple of endo's while leading the bike line through this section. The first CP was pretty easy - though it was on the side of the trail I was not expecting (right, not left). 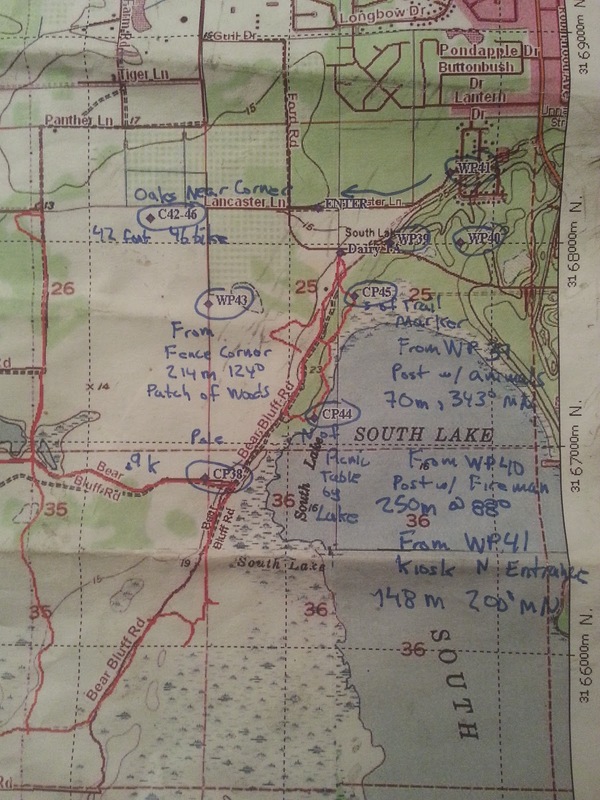 The second CP was a simple out and back on the tower in Buck Lake, and the other four checkpoints were easy even in the darkness just be having good accurate measurements on the map ahead of time. This took us to the start of the boat leg at the boat ramp as Six Mile Creek on SR46 and we arrived with Good'Nuff, Primal, FLX, all within a few minutes of each other. 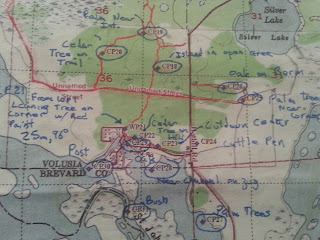 We headed north up the creek to CP7, where we took out of the boats for a short foot section.CP8 looked like an easy find - go west to trail and follow to CP - this was not the case - there were LOTS of trails and no clear distinction between them. All teams bailed back to the boats and we shot a bearing to find CP8. 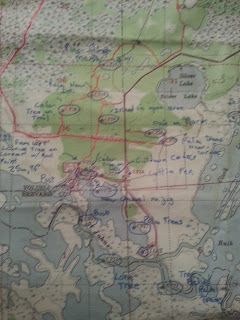 The rest of the course was easy navigation, though we did get to do an early morning swamp whack through a VERY wet section, there was another way around, but we did not take it. We arrived back at the boats with FLX and Good'Nuff and headed south for the paddle leg. 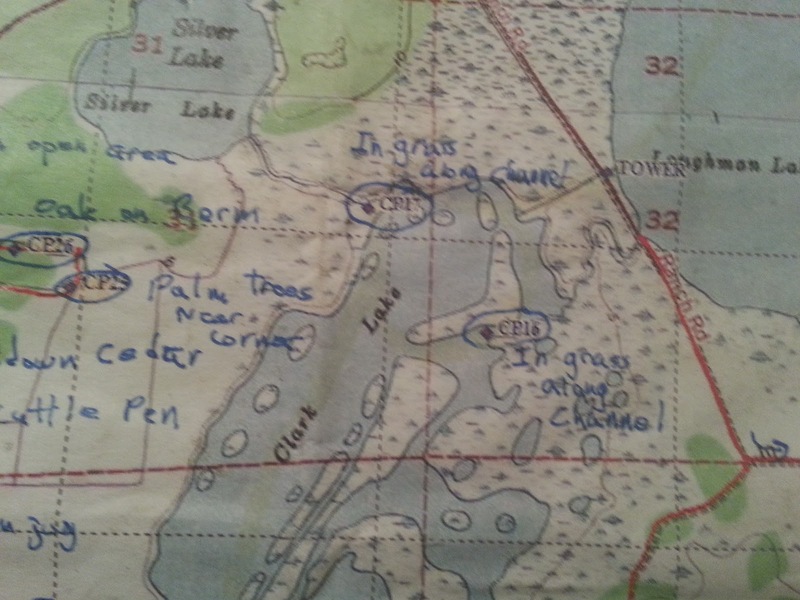 The first 2 points of this leg were easy, there was a little challenge finding the entrance to Shad Creek, and there was a lot of large grass islands - but we basically moved on the correct bearing and we got to the correct locations. 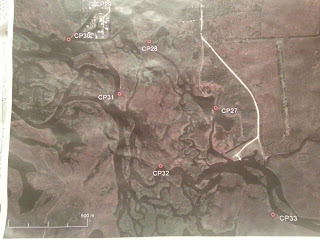 After crossing the tower bridge on the south end of Loughman Lake - we had to CP's to find in a maze. I used a bearing to go for CP17 first. The clue was in grass on edge of channel (everything was grass and creeks). By using the bearing from the tower (which was visible from pretty much everywhere) I was able to make sure we were at least on a correct bearing and we quickly found CP17. I took a bearing from CP17 to the location of CP16 and we essentially boat-whacked our way through heavy weeds to CP16 (I also used the bearing to the tower to triangulate). We had gone into this section Good'Nuff and FLX - but as we came out we saw nobody behind us. When we reached the boat ramp at the TA - it was confirmed that we had a pretty solid lead on the teams behind us - and we started out on the second paddle. Here is the start of the long paddle leg. 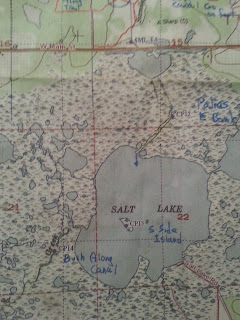 CP16 and CP17 shown here were the most challenging on this leg. 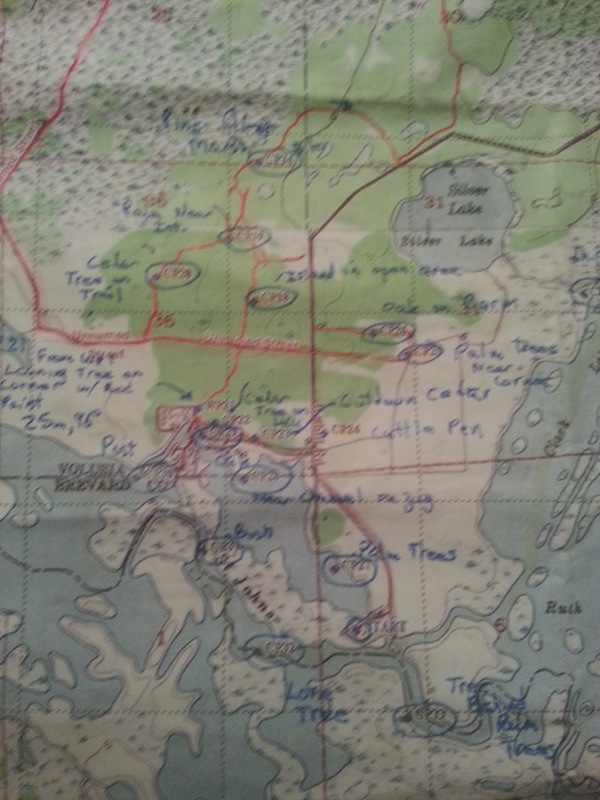 This was through a maze of channels - but we had a good map, and we quickly completed this (I suspect this was probably the paddle leg of the sport race). A highly motivated Team Good'Nuff was working hard to erase our lead here. 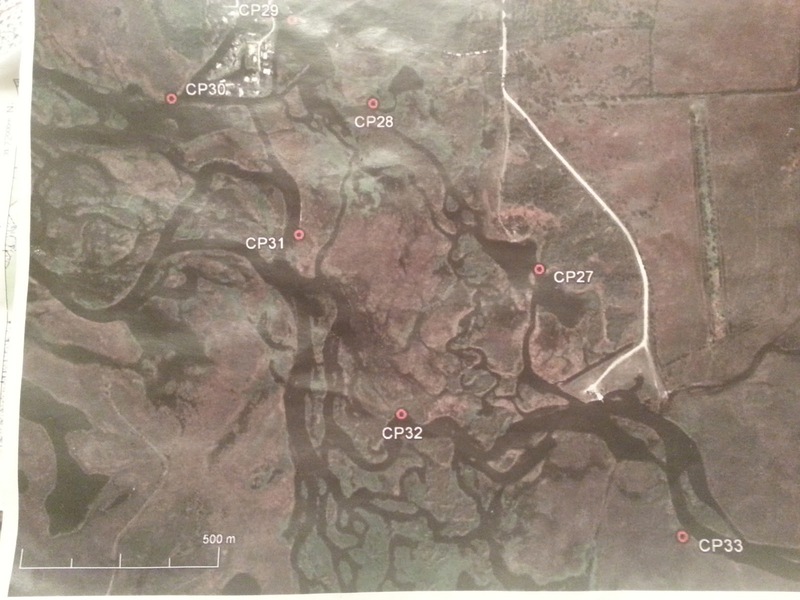 This was a great map for the paddle 2 - we moved through it pretty quickly. 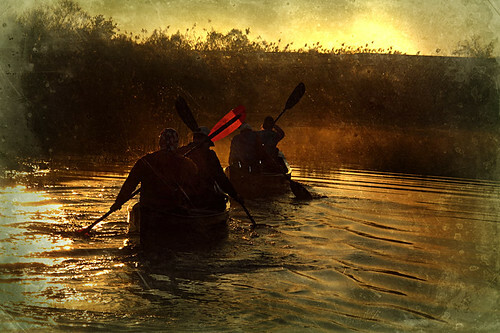 We took a long time transitioning to foot for the next leg, and as we headed out we saw FLX and Good'Nuff heading in from the second paddle - hot on our heels. We wen first for the cattle pen, and the 2 CP's to the east of Hatbill Road. 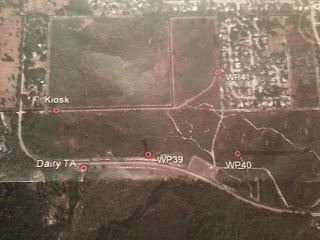 We then headed back into Seminole Rance where we picked up 3 more an then headed out to the road (Unnnamed Street). 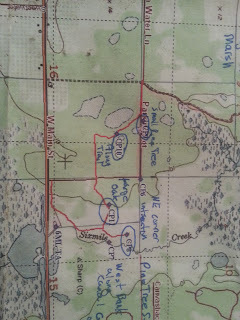 There was no discernible trail south of CP20 (that we saw at least), we simply bushwhacked through open woods to the intersection of the trail heading south to WP21. The only CP to give us any trouble here was CP23 the one on the cut Cedar Tree - but only a few minutes. We saw a few other teams on this leg, inclduing Team Mojito's on Monday just starting into the trek. After getting all the CP's a short run back to the TA, and we were ready to head out on the bike/run/bike leg. We did not know at this time, but the race was shaping up to be a 2 team race. The next leg was a bike/run/bike leg. We were leaving with Good'Nuff right on our heels - and they are probably the strongest biking team in the Southeast. We hooked Wanda up on the tow and headed out. Good'Nuff passed us right at the water crossing, we got there first and were able to use the canoes to transport the bikes (but we swam) across the channel. Of course there was no way to get the boats back across as the ropes that were supposed to be used were not tied to anything on the shore - the boats were simply tied to each other. We stayed pretty close with Good'Nuff until CP36, but we simply did not have the bike legs to stay with them. There were also a couple of bike death marches in the south section and also a third one approaching CP38 down newly "disked" Bear Bluff road which was completely un-rideable. I noted that Good'Nuff took a different route and had been able to avoid that final death march.After what seemed like forever we finally got to the Dairy TA and the final trek leg. Once we started the trek leg we knew we were going to run out of time. 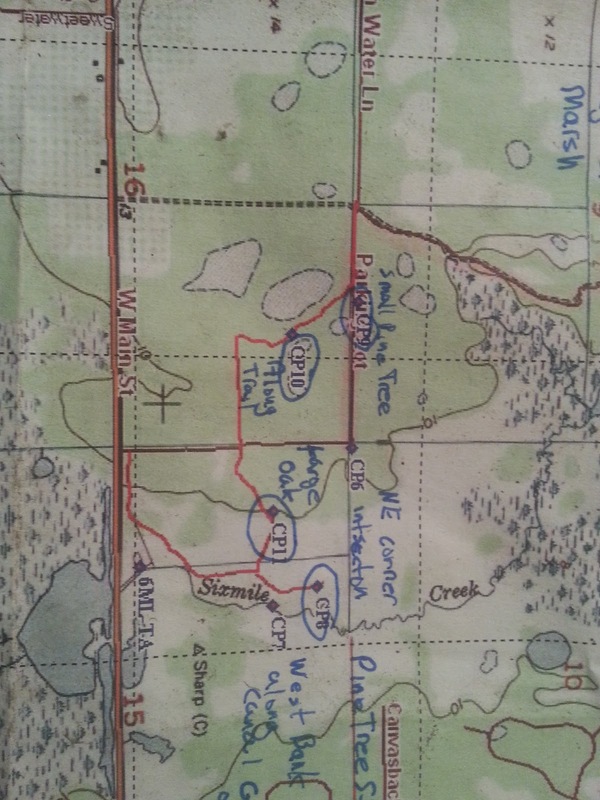 The course had three bearing points - and I went ahead and plotted them on the map they gave us at the TA. 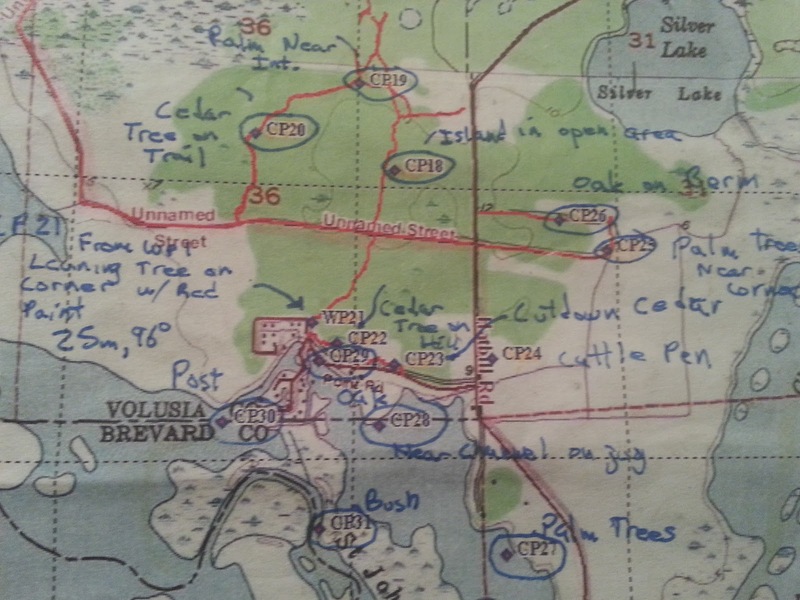 This allowed us to bypass the long bushwhack on these and head straight for the actual CP - which for the first one happened to be on a trail (I actually mis-plotted it the first time, but replotted and we quickly found it). We also went for one quick on to the south of the TA and then hopped onto the bikes for the long ride back. On the final bike leg CP46 took us way too long, which meant we ended up having to bail on CP48 on the way back. We caught up with Good'Nuff who was also out of water at CP47 (I had an extra water bottle for them). On the way back we swam both crossings (which as it was getting cold - felt cold), and finished with 6 minutes to spare (in 1 hour 20 minutes). In the end Good'Nuff cleared the course - which was no small feat. We came in second after putting it all on the course. Many thanks to Dave Brault for the incredibly punishing course, and Pangea for giving us a great challenge. I am a college professor, adventure racer, computer programmer, husband, and father, and a true believer in living life to its fullest. Check out some of my games I invented at I See Cards and Pyramath.